I find myself just approaching peak dipnetting season on the Kenai river. You see, in Alaska, we are given “special” rights as residents. One of the most important of those rights is access to subsistence fisheries. Over the last couple of days I have found myself studying closely historical fish count numbers. My plan is set to attack on July 19-21. Those days are set aside for me to catch, clean, and process up to 25 sockeye salmon. Get out of my way. In anticipation of such a bountiful harvest, it is time to clean out the freezer. You see, I haven’t finished all of last years Reds. Just a few have been hanging out at the back of the freezer, covered by new purchases and shoved to the back. Well I went digging and will not let any go to waste. This is what a properly cared for and vaccum sealed Kenai River red looks like after one year in my freezer. My philosophy when dealing with such a top notch ingredient is to just not mess it up. Get out of the the way of your own ego and let the ingredient show itself. In respect of that philosophy, these filets were seasoned with olive oil, kosher salt, fresh cracked pepper, caper powder, and lemon peel powder. The powders are made by slowly dehydrating first the capers and then lemon peel poached in simple syrup. These are then ground in a spice grinder. These can go in the fridge and wait until everything else is ready. Now is the time to start on your corn and black bean relish/salsa/salad or whatever you want to call it. Being born in Illinois makes me somewhat an expert on corn. At least enough of an expert to know that paying $1.29/ear is straight up highway robbery. Seriously, WTF, I live in Alaska, not on the moon? I remember stopping at a friend’s field on the way home from Dad’s work. Grabbing what we needed and not only was it free but you might get a bushel of squash or green beans to go along with the corn. That being said, I broke down and bought my first ear of corn in a very long time. The husks were gently peeled back and the silk removed. I buttered the corn and seasoned with kosher salt and pepper. This goes on the grill along with red bell, pasilla, and jalapeno peppers. You know the deal. Get a good char on the pepper skins, cover, and refrigerate. Just long enough to allow easy handling while seperating the skin from the flesh of your peppers. 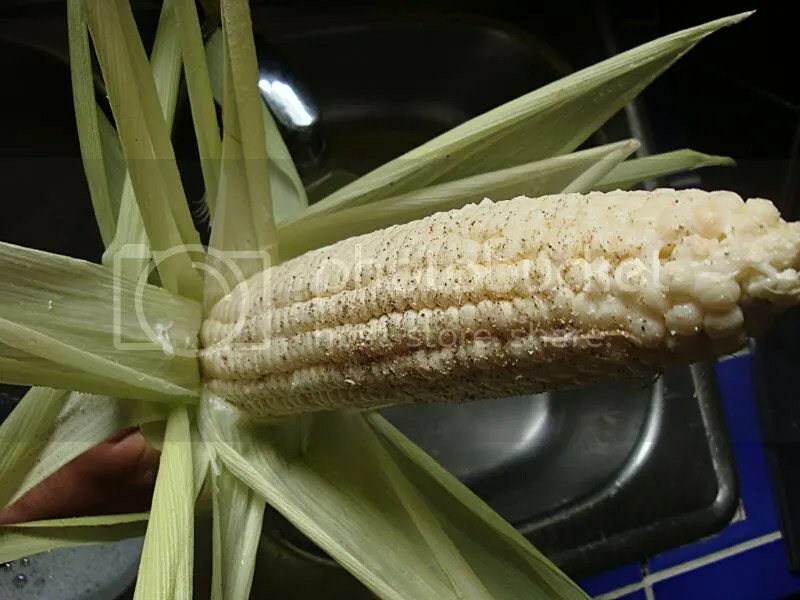 Then carefully slice the roasted/charred corn off of the cob and feed the cob to your way too old begging dog (he is now almost 14 and so I spoil him way more than I should). 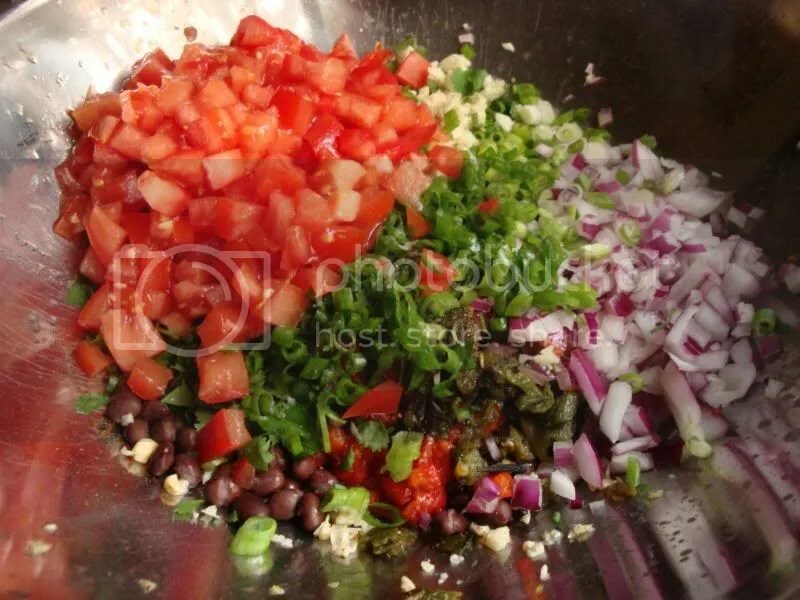 The pepper flesh gets chopped and added to the corn along with chopped red onion, green onion, a large diced tomato, cilantro, 1 can of well rinsed black beans, 3 cloves garlic, and the juice of 1/2 lime. This was all seasoned with some fresh ground red New Mexico dried chile, kosher salt, and pepper. I left all of these ingredients warm. Especially the tomatoes. We get crap for tomatoes up here so I have to “cure” them at home. During the summer months I take store bought tomatoes and sit them in the window to absorb as much sunlight as possible. They are most flavorful while still warmed by the evening sun. After tasting this, I seriously thought about just stopping there and eating only the black bean salsa with some chips. It is really that good. The salmon was already prepped so I decided to just get on with it. 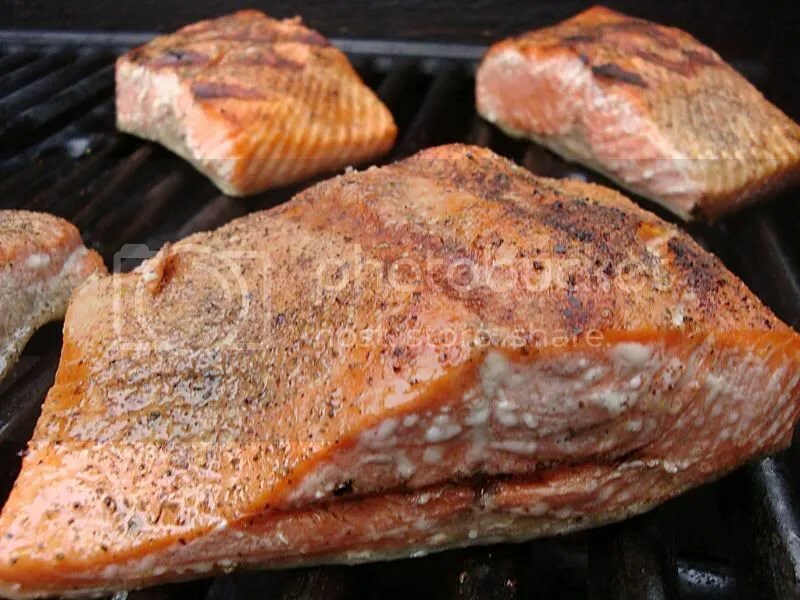 On a well oiled and pre-heated grill, place your salmon pieces flesh side down. I let them go about 2-3 minutes and then flipped. I will say this as many times as I feel neccesary, overcooking fish (or good beef for that matter) is a sin. After flipping I let these go for just about a minute with the skin side down. They are still soft to the touch. See that fat just starting to ooze out the sides? MMmmmmmmm! 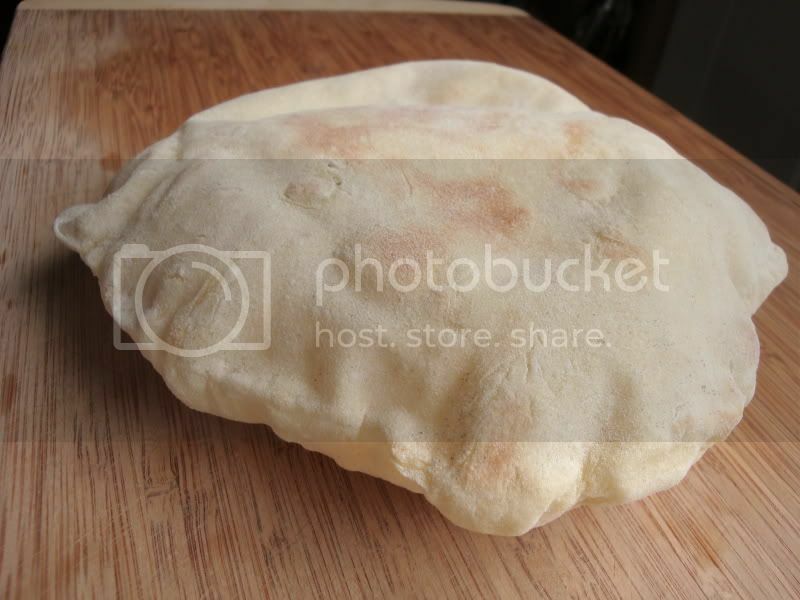 I tossed on some flour tortillas when I flipped the fish and allowed them to warm on both sides. About 30 seconds on each side. Now take them back inside and assemble you dinner. 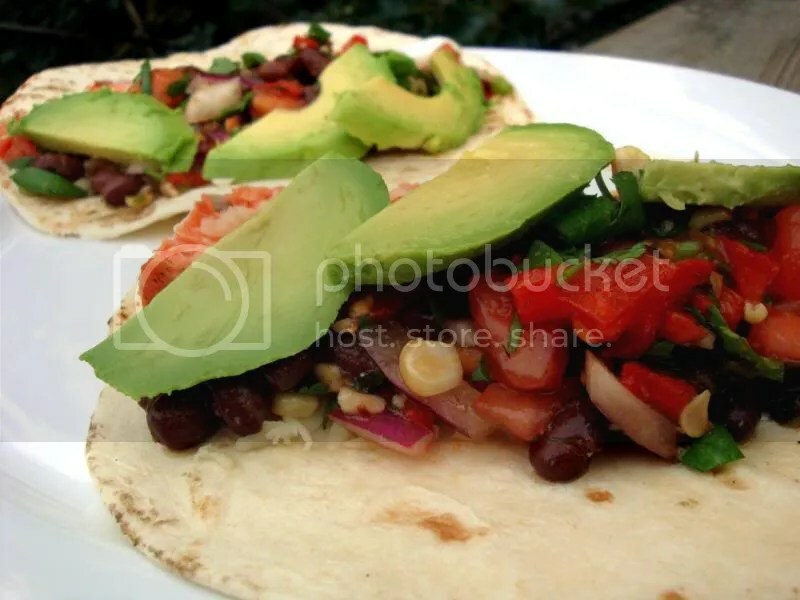 On the warm tortillas go your skinned pieces of salmon, grated pepper jack cheese, the black bean and corn salsa, slices of fresh avocado, and just a little bit of sour cream. I have made many, many fish tacos. These were my very best. Everything seemed to just add to every other ingredient. The spicyness, creaminess, crunch, smoke, and fresh flavors combined in a balanced mix that I am thankful to have documented. Too many times I let the alchemical mix fade out of my memory. Not bad for year old fish. ~ by climbhighak on July 11, 2009. Hey, thanks for stopping by my blog. That black bean salsa looks so good. I think I could eat some right now, and it’s only 10am! 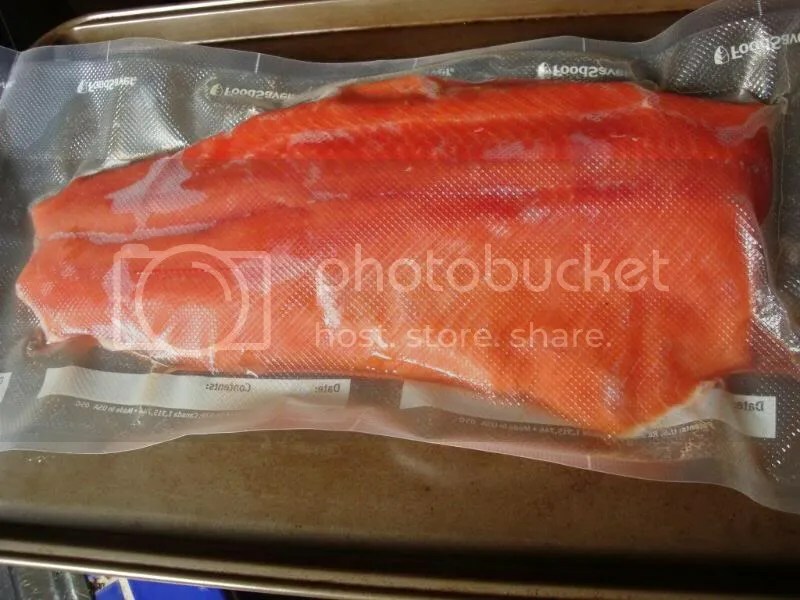 A good Food Saver (or other brand of vacuum sealer) is essential to any Alaskan household. So much fish and game is available for just a few months out of the year. Come winter it is nice to have fish at your fingertips without paying out the nose. I am not a big fan of salmon skin. It went to the dog as well. Superb! Grilling the veggies sure does make a difference in flavor. Well done! I second your comment about the food saver. I learned my lesson last year when I put off buying one. A year later and the salmon is ruined and only suitable for dog biscuits. 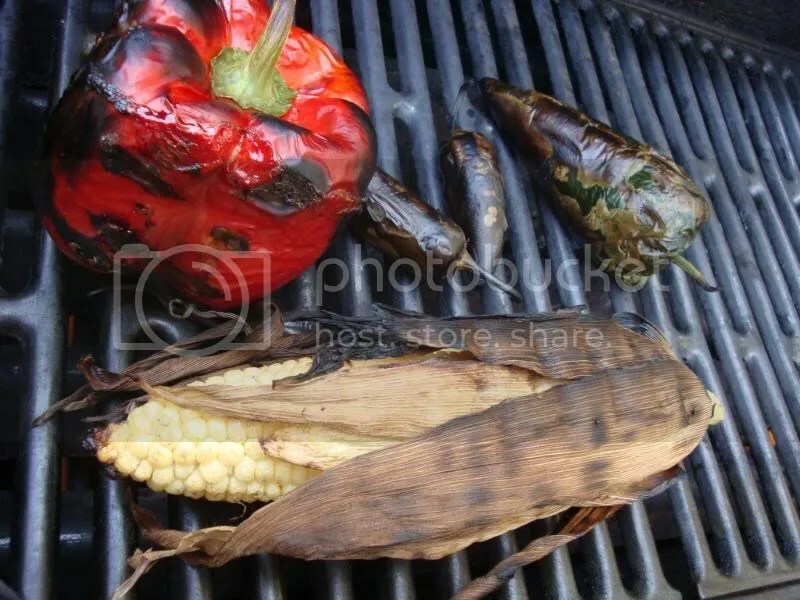 The grilled peppers and corn really did add so much flavor. I almost grilled the tomatoes, red onion, and green onion as well. Next time I will and even have some smoke chips on the grill while they are grilling. Why is it that when I use canned beans that I feel like I am cheating? 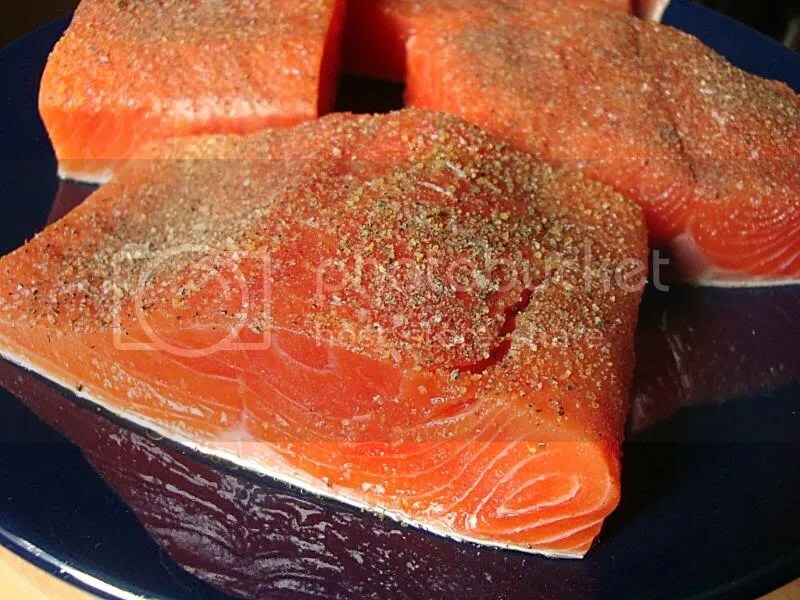 Freezer burnt salmon does make good halibut, crab, shrimp, and bear bait. I hear you on the canned been thing. It bothers me too but sometimes I just go with it. I said it before i’ll say it again..wish i was there to help you clear your freezer and im jealous =;). Those salmon fat wow!! What do you do w/ the belly? My sister from California just brought me a lot of salmon belly, w/c i love. I have been cooking them and never gets tired eating them. I love the skin as well. Ranch Market a big Asian store in California sells every part of the fish and i love most are the head and belly. Those salsa are so colorful and i’m sure they are delicious as well. Traditionally, sockeye bellies are use to make “squaw candy”. Those are extra sweet and heavily smoked strips of belly meat. To get that you filet the fish without cutting through the ribs and also without gutting the fish. Basically making two smaller side filets with one belly strip. I prefer to filet the fish into 2 larger filets with the belly meat still attached to each side filet. Does that make sense? Wow Robert, you make salmon look good! (I am not a fan) I am certainly gonna make the salsa, and kudos to you for doing it almost all from scratch! For us, corn is tricky. For a month or two it is dirt cheap, sometimes as low as 10 cents an ear. In the off season, it is up to $1.50 an ear. LAME! I hsve been itching to try out my new tortilla press. looks like i know what to have with it! I agree….not bad at all for year old fish! In fact fantabulous!!! I love the extra care you extended while you wove this delicious meal – being a huge fan of fish tacos…I have tried so many variations and the carino that you showed here is exceptional. Will be trying this in the next week for sure. 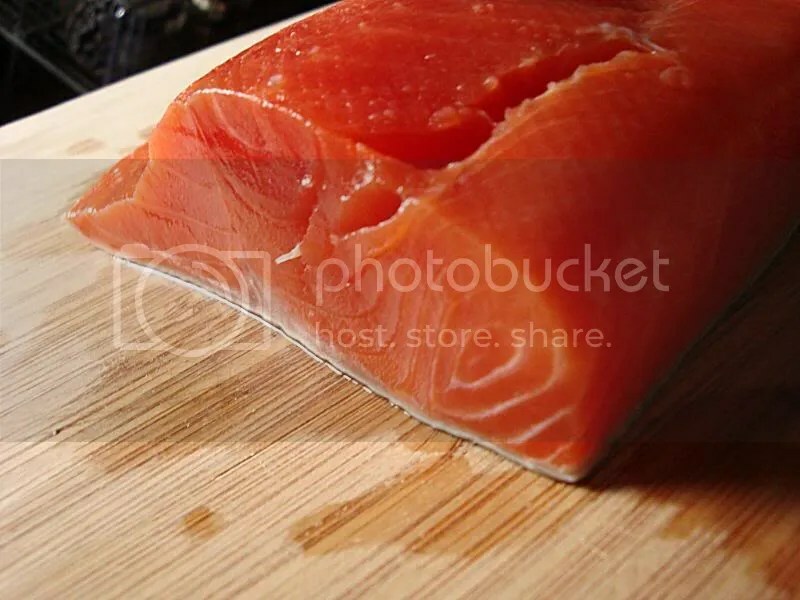 Not sure I will have the salmon…so if you have any tips for other types of fish be sure to shoot them off to me… I know that we might have mahi and ahi avail… the flavors are a bit different ~ advise plz. These fish tacos sound great! I really like the black beans in the salsa! Outstanding job, both on the tacos and on the photos. My grandfather lived on the Kenai Peninsula in Nikiski :). This brings back memories. 🙂 It looks delicious, by the way. I usually don’t follow a specific recipe. 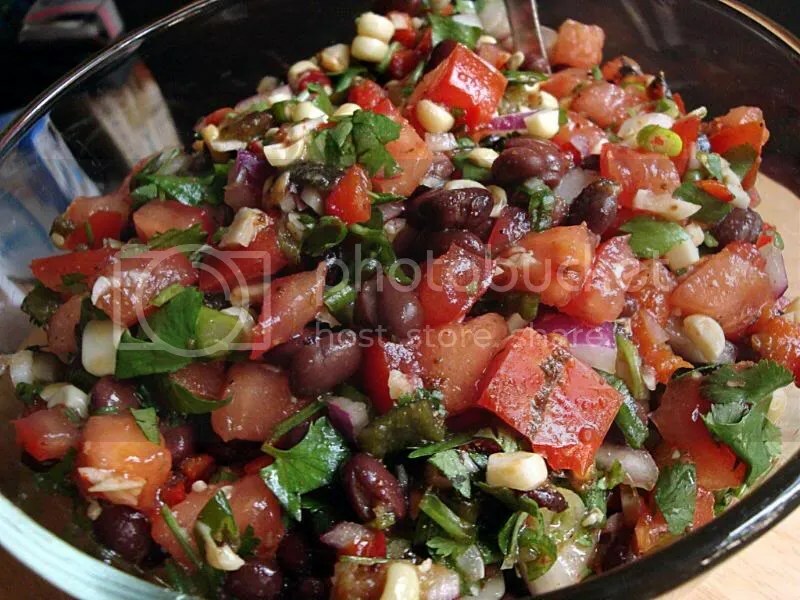 The black bean salsa is just one of those dishes that you can use anything you like in the amounts you want.